Washington, DC, March 31, 2016 (MACP) — “The increasing links and flow of recruits between… regional extremists and the so-called ‘Islamic State’ in Syria and Iraq, as well as al-Qa’ida affiliates and allies across the region” are “of growing concern for African security interests,” according to a new report from The Inter-University Center on Terrorism Studies (IUCTS) and the Potomac Institute for Policy Studies. 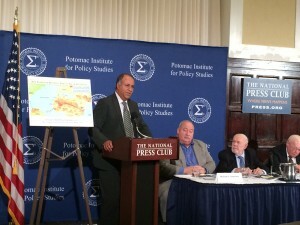 Released Wednesday at an event at The National Press Club, the seventh annual report, “Terrorism in North Africa and the Sahel in 2015,” reveals that while the number of terrorist attacks in the region fell year-to-year, “the overall strategic impact regionally and globally was far more dangerous [in 2015] than previously,” due to these growing extremist ties, as well as deteriorating conditions in Libya. In the Maghreb, only Morocco and Mauritania did not experience terrorist attacks, according to the report. Speaking at the event, Moroccan security expert and founder of the Marrakesh Security Forum Dr. Mohammed Benhammou outlined Morocco’s multidimensional security approach: good “security governance”—deep cooperation between the various security forces in the country; as well as training and improved capabilities; management of the religious spectrum, where Morocco has trained imams and women spiritual guides to ensure that mosques remain places of worship rather than political activity or extremist ideology; and a strategy of human development that offers alternatives to those most vulnerable to extremism. “As the IUCTS report drives home, the situation in North Africa and the Sahel is increasingly dangerous and calls f or concerted regional action,” said Jordan Paul, Executive Director of the Moroccan American Center. “Resolving the Western Sahara issue based on the Moroccan autonomy plan is essential to promoting regional cooperation and coordination. The US must offer continuing support and encouragement to Morocco, its oldest, strongest and most stable ally in the region.